When you get married, the law recognizes you and your spouse as a single person (or “entity”), rather than two. For example, when two single people own a piece of property together, under the law they are “joint tenants” and each has a one-half interest in the property. If one of the two people dies, their one-half interest will pass according to their will or according to state law if they don’t have a will. The surviving person would only get the property if the deceased person left a will and left his or her share of the property to the survivor. Then, if the two people in our scenario get married, under the law they can hold title to the property as “joint tenants with the right of survivorship.” Those words are like magic. They mean that in the eyes of the law, the two people are recognized as one. If one of the two people in this situation dies, the whole property automatically becomes the property of the survivor. No will is even needed. No new deed is needed. Nothing is needed for the property to be wholly owned by the surviving partner, nothing except the magic words, “with the right of survivorship.” This can complicate the division of property when a couple decides to divorce. Once the assets are listed and classified, they next need to be valued. The value can be an amount the parties mutually agree on or appraisals can be made to determine current fair market value. When you and your spouse can’t agree on the values of real estate, or investment accounts, or business ownership interest, sometimes experts have to be hired to do appraisals and evaluations and then come to court to testify. Then a judge will make a “finding” of what the value is based on the evidence presented in court. The final step is dividing the property. 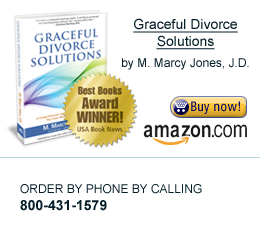 Again, this is achieved by agreement between you and your spouse or by litigation if you can’t agree. My challenge to you is to go through your situation with a trusted lawyer and do a serious cost-benefit analysis to figure out the best way to get to resolution for you. You need to factor in the cost of litigation if you can’t agree and end up going to court.